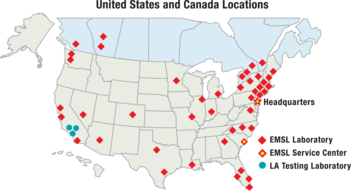 EMSL Analytical, Inc. has been providing extensive asbestos, lead, silica and man-made vitrious fiber (MMVF) analysis at the World Trade Center in New York, as a result of the terrorist attack in September 2001. EMSL Analytical, Inc. has also been providing consulting regarding analytical methodologies, method development and in depth studies characterizing the particles in the dust that was deposited throughout lower Manhattan. Over 87,000 tests have been performed by EMSL during the past two years, including PLM, PCM and TEM analysis, with turnaround times varying from 24 hours to 72 hours.